Much of the product of Austro-Hungarian loom, work bench and forge was quite artistic and charming; that there often was displayed fine taste and originality of conception. Many of the manufactures - such as glassware, china and tableware, leather goods, furniture and articles of domestic decoration, as well as the cloths of Bohemia, etc. - bore a stamp of their own and were appreciated by the connoisseur. But admitting all that, the fact was still true that the whole methods in vogue in its industry were antiquated and did not admit of those processes of standardising and of rendering the volume of output so large and at the same time the selling prices so cheap as to readily admit of competing with more wide-awake nations. The air of Austria or Hungary was not conducive to the growth of the modern captains of industry that elsewhere had left their mark. And the trend of those elements in both halves of the monarchy that have capital to spare was not, on the whole, in the direction of industrial investments. The Skoda Works was one of the very few exceptions. Czech financiers played a significant role in the development of heavy industry. 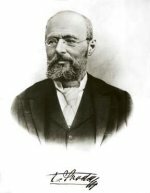 Emil Skoda (1839-1900) became the major arms producer in the Habsburg Empire. Czechs like Emil Skoda and Tomas Bata [the shoemaker] became symbols of the new Czech capitalists. The fortunes of the Skoda Works were interwoven with those of Plzen through several generations of employees. The Skoda factories were founded by Count Wallenstain in 1859. Count Wallenstein-Vartenberk set up a branch of his foundry and engineering works in Plzen. The output of the plant, employing over a hundred workers, included machinery and equipment for sugar mills, breweries, mines, steam engines, boilers, iron bridge structures, and railway facilities. In 1866, ing. Emil Škoda, a highly competent engineering expert and dynamic entrepreneur, became the Chief Engineer of the factory which had more than a hundred employees. In 1869 it was taken over by Emil Skoda, the Czech engineer, who employed 130 people. Emil Skoda purchased the factory from Count Waldstein for 167000 gulden with money borrowed from his physician uncle in Vienna, Josef Skoda the great Viennese clinician. Skoda had originally been employed in the iron works of Wallentein (Valdstejn) in Pilsen. After a short time Skoda expanded the factory and in the 1880s he founded steel works, which were very modern for his era and were able to deliver castings weighing tens of tons. Steel castings and later forged pieces for large passenger and military ships became, together with sugar refineries, important export articles of the Škoda factory. When engineer Emil Skoda purchased a small engineering works located in the center of Plzen, then a town with a population of 30,000, he set out on a path leading to the major development of his plant and fame for Plzen around the world. The coalfields at nearby Nýrany and local iron-ore deposits gave rise in the 19th century to Plzen's engineering industry, symbolized by the Skoda Works, which occupy most of the city's western sector. Skoda was quick to expand business, and in the 1880s founded what was then a very modern steelworks capable of delivering castings weighing dozens of tons. Steel castings and, later, forgings for larger passenger liners and warships went on to rank alongside the sugar mills as the top export branches of Skoda's factory. Initially Emil von Skoda held a majority of shares, but the Creditanstalt soon acquired a controlling interest. 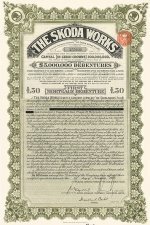 The Skoda firm became a joint-stock company in 1899 to raise capital for expansion. It was founded in 1899 by the Creditanstalt and the Czech Escomptebank to acquire the existing Company E. Skoda Pilsen, including land, equipment and railway equipment. 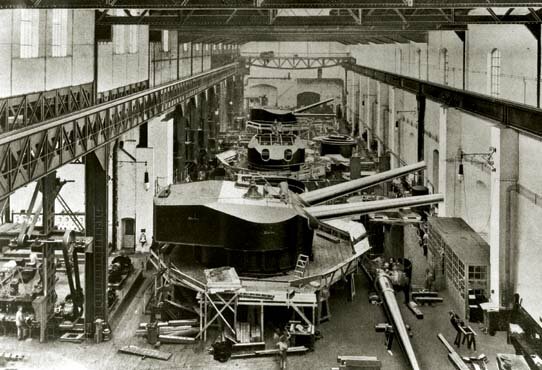 For decades the company's workshops produced steam machines, equipment for sugar factories, breweries and power stations, machine tools, engines and large forgings applied in the construction of ships. For many armies, the Skoda Works were for years one of the largest suppliers of weapons in Europe. 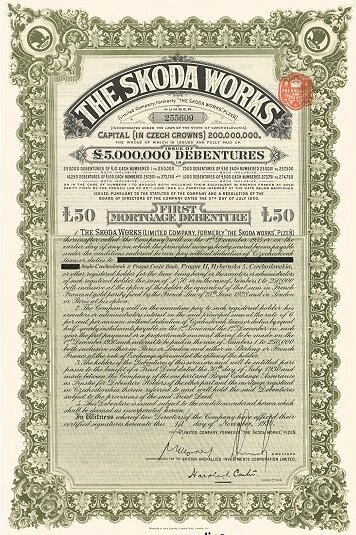 In 1899 the ever expanding enterprise was transformed into a joint-stock company, and in the new century Škoda works became the largest arms factory in the Austro-Hungarian Monarchy predominantly supplying heavy guns and ammunition to naval and land forces. Not only castings were exported, of which piping sections for the Niagara Falls power plant and for Suez Canal sluices is particularly worth mentioning, but also machinery for sugar refineries in Turkey, breweries throughout Europe and artillery materials for the Far East and South America. The Skoda Works were part of the Creditanstalt group and most of the manufacture of artillery was concentrated there. The Skoda works (directed by Emil and Karl Skoda) had become the Monarchy's major producer of machinery and armaments by the 1900s. Skoda Works became the largest arms manufacturer in Austria-Hungary. It was a navy and army contractor, mainly supplying heavy guns and ammunition. Exports included castings, such as part of the piping for the Niagara Falls Power Plant or for the Suez Canal sluices, as well as machinery for sugar mills in Turkey, breweries throughout Europe, and guns for the Far East and South America. By 1914 Skoda was one of Europe's major arms producers. At the Skoda Works in Pilsen everything was done on an enormous scale - grounds covered, trip hammers of a hundred tons apiece, 30,000 men toiling and sweating for good pay; and capital galore. And enormous profits; during the Great War one of the Krupps became a partner. A Czech, Baron Skoda, was the brain of the concern, and a number of able German engineers were the sub-brains. The First World War brought a drop in the output of peacetime products. Huge sums were invested into expanding production capacities. By this time, Skoda Works already held a majorities in a number of companies in the Czech Lands and abroad that were not involved in arms manufacture. In 1917, the company had 35,000 employees in Plzen alone. The Skoda gun, the Austrian 30.5 centimetre (12-inch) howitzer, manufactured at the Skoda Works near Pilsen, was not a surprise: it was tested in the presence of foreign military attaches in 1912. During the Great War some officers in the German ordnance department considered the big guns turned out by the Skoda works in Austria superior to those of Krupp. Just before the War the Skoda plant completed its triumph - the 30.5 c.m. howitzers drawn by traction engines. "See," the objectors claimed. " Skoda is better than Krupp." "Wait," said Bertha Krupp." These Skoda guns, while the biggest movable guns in the world today, are not big enough." And she produced for Germany the famous 42 c.m. howitzers, whose shells were nicknamed "Busy Berthas." These formidable 42-centimetre howitzers laid Liege and Antwerp low. The Archduke Leopold Salvator was for a number of years before the war, and during the War, the very important post of inspector of the entire artillery for the Austro-Hungarian army and navy. In that capacity he strove hard to obtain from the two parliaments grants sufficient and in time to construct those heavy ordnance which all military experts had predicted would be indispensably needed in the next great war. His efforts proved in vain; at least the appropriations were made too late and in amount quite insufficient. Archduke Leopold Salvator, though personally strongly averse to war, had all along been convinced that such a great war, with all Europe for long resembling a powder magazine, was bound to come. On an understanding with the aged emperor, but unknown to either the Hungarian or Austrian parliament (except a few members in his confidence), the archduke managed to have those much-needed heavy guns made, mostly at the Skoda Works in Pilsen; to have them tested thoroughly and installed in the army. These were the marvellous 30.5 centimetre howitzers and the 42-centimetre mortars that played such a decisive part in the early days of the war. They had been designed, made and tested wholly without the connivance, even the knowledge, of the German general staff. Liege, it may be recalled, fell before these guns, and the quick capture of Antwerp was also largely due to them. Soon after war was declared the Skoda works in Austria, practically the equal to Creusot in artillery technique, sent a battery of 30.2-centimeter howitzers to be tried out in comparison with the 21-centimetre field and the 28-centimetre siege howitzers of Krupp make. These are the three types of pieces that finally reduced the chain of forts defending Liege and Namur to fragments, but as the maximum calibre was held by the Skoda guns some observers got the notion into their heads that Austria furnished the big guns and not Prussia. It was not until the army of General von Kluck crossed the Meuse and the bombarding of Fort Maubeuge began that the "Brummers," the 42-centimeter Krupp automobile mortars, were allowed to decide the issue, hence the confusion in terms and calibre by "veteran" war correspondents.